Well, prefab and modular home builders, get ready for something that is the opposite of what we normally talk about, but gets at the same goals. 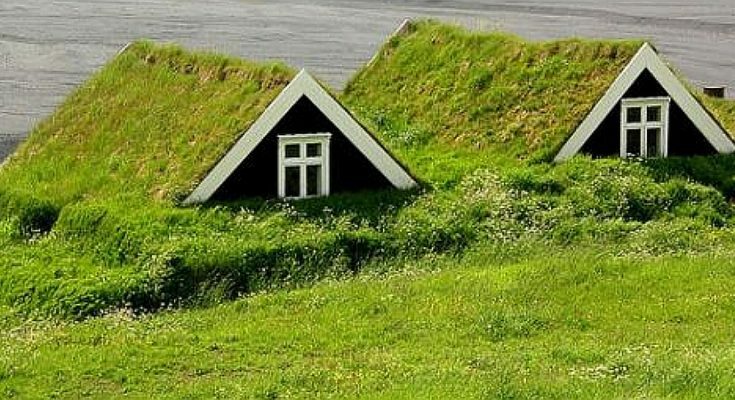 That’s the thing about these all-natural turf houses. Like prefab and modular homes, they save money by using economical building materials and building procedure. They’re ecological to live in. One thing that’s very different, though: you can’t move a turf house quite as easy as a prefab house! But the benefits of modular home building are there. You can easily expand or modify the shape / size of the house. 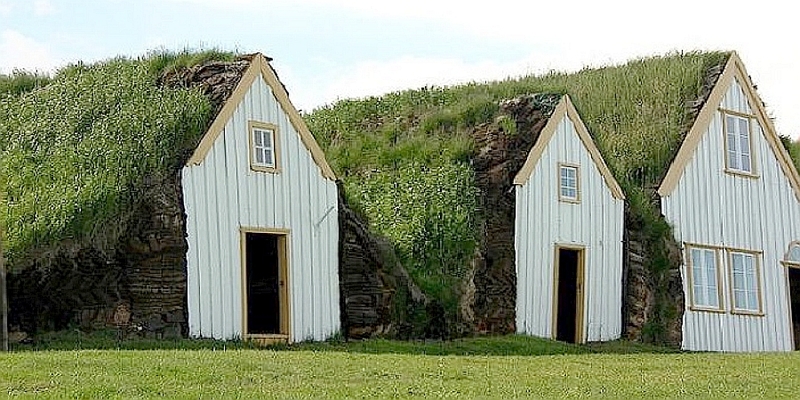 These tuft houses are on Iceland, and the building style dates back to around the 9th century there (colonization by vikings and other North Sea people took place on Iceland then. Before that, there were only monks, castaways and foxes living on the island. This building style is similar to that used by foxes and other burrowing animals, by the way! 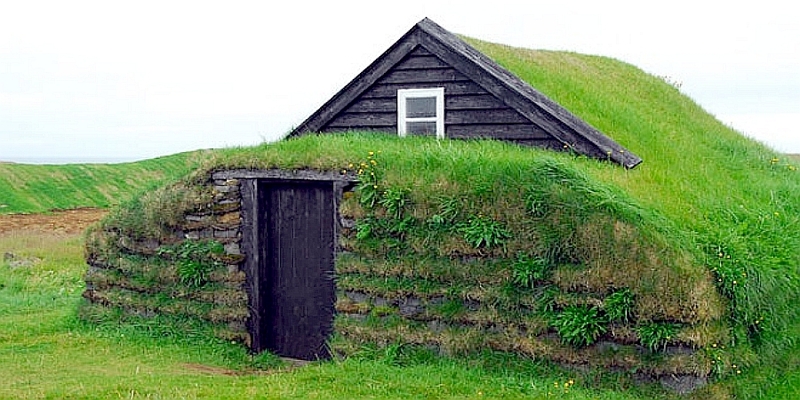 These buildings are also called earth houses or sod houses, smelts, or “gamme” (a Scandinavian term). 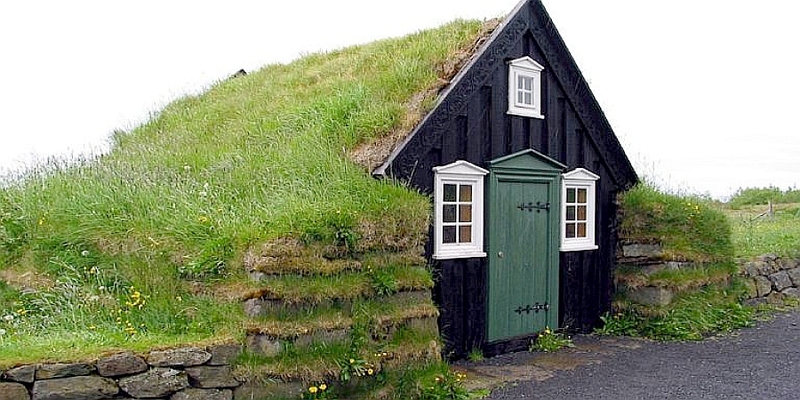 The turf houses of Iceland are a bit different from much of continental Europe though, because they’re based on the long house building style, which was popular among the vikings and other North Sea people in their countries of origin. How to build a turf house is somewhat intuitive. It’s just stacking up material into a dome (or other) shape and making sure you have an opening above for smoke from a fire to escape (newer versions have chimneys). To start, the size and location is planned and the foundation (dirt) is considered. Then a skeleton of the dome or other structure is built using sticks and logs. Then sometimes a covering is added to keep the next dirt layer from dripping dirt into the shelter. This can be bark shingles or other debris-proofing. Then tuft is stacked around and over the dwelling. And that is pretty much it, although they are more elaborate ones with various elevations, firepits, rooms, etc. A photo below shows the most basic way turf houses are built. Although there is a lot of room for using whatever material is available and whatever modifications a builder wants to incorporate. Anyone with any living-room fort building experience can probably understand how these go up quite easily. For more interesting homes, find them at Building Homes and Living.